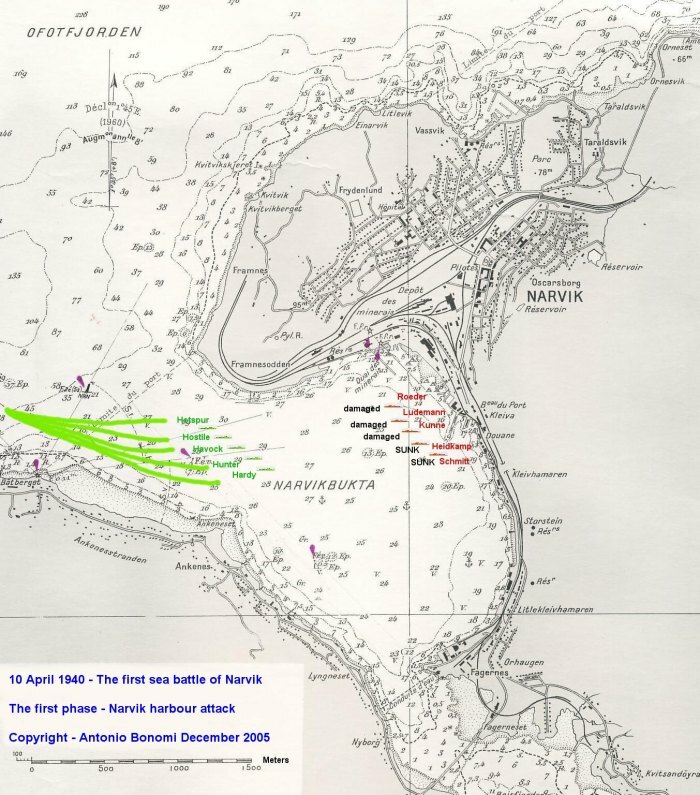 here you go with the battle of Narvik,: here the first part of April 10th, 1940. The 5 British destroyers entering OfotFjord and arriving un-noticed in front of Narvik harbour. The surprise attack to the 5 German destroyers anchored for refuelling into Narvik Harbour. The British destroyers disengagement and the surprise to be caught in the middle of OfotFjord by the other 5 German destroyers. A closer view of the second phase. Thank you very much as usual Antonio! The day after the German invasion, the Royal Navy took an opportunity to defeat the Kriegsmarine. The 2nd Destroyer Flotilla under Commodore Bernard Warburton-Lee comprising six H class destroyers (HMS Hardy (flagship), Hotspur, Havock, Hunter and Hostile (British H class destroyers were smaller than the German destroyers) moved up the fjord in the early morning. The German picket ship (Diether von Roeder) had left its post due to a misunderstanding and, as the British flotilla approached Narvik, they surpised and engaged a German force at the entrance to the harbour and sank two destroyers Wilhelm Heidkamp (killing Commodore Bonte) and Anton Schmidt, heavily damaged the Diether von Roeder and inflicted lesser damage on two others. They also exchanged fire with German invasion troops ashore, but did not have a landing force aboard and therefore turned to leave. They were then engaged by three more German destroyers (Wolfgang Zenker, Erich Koellner and Erich Giese) emerging from the Herjangsfjord, led by Commander Erich Bey, and then two more (Georg Thiele and Bernd von Arnim) coming from Ballangen Bay, under Commander Fritz Berger. In the ensuing battle, two British destroyers were lost: the flotilla leader HMS Hardy, which was beached in flames, and HMS Hunter, which was torpedoed and sank. A third, HMS Hotspur, was also damaged badly by a torpedo. Hotspur and the other remaining British destroyers left the battlefield, damaging Georg Thiele as they did so. The German destroyers, now short of fuel and ammunition, did not pursue and the British ships were able to sink seven German or German-seized transport ships outside Narvik port, including the supply ship Rauenfels. Soon the German naval forces were blocked in by British reinforcements, including the cruiser HMS Penelope. On 11 April, Erich Koellner sustained further damage when it ran onto uncharted rocks. 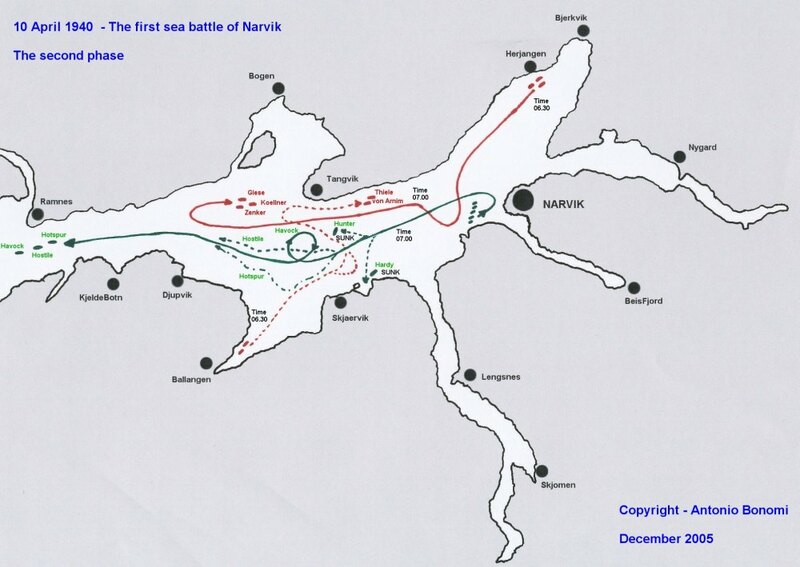 As the British destroyers left the Vestfjord outside Narvik, two German submarines, U-25 and U-51, fired torpedoes at them, but German torpedoes at the time had severe problems with their magnetic detonator systems - possibly due to the high northern latitude: all of them failed and either did not detonate at all or detonated well before their targets. The Royal Navy considered it imperative, for morale and strategic purposes, to defeat the Germans in Narvik, so Vice Admiral William Whitworth was sent with the battleship HMS Warspite and nine destroyers; four Tribal class (HMS Bedouin, Cossack, Punjabi, Eskimo) and five others (HMS Kimberley, Hero, Icarus, Forester and Foxhound), accompanied by aircraft from the aircraft carrier HMS Furious. These forces arrived in the Ofotfjord on 13 April to find that the eight remaining German destroyers, now under the command of Fregattenkapitän (Commander) Erich Bey, were virtually stranded due to lack of fuel and were short of ammunition. During the opening stages of the battle, a Fairey Swordfish launched from Warspite bombed and sank the German submarine U-64, at anchor in a side-fjord near Bjerkvik. Most of the crew survived and were rescued by German mountain troops. This was the first U-boat to be sunk by an aircraft during the Second World War. In the ensuing battle, three of the German destroyers were sunk by Warspite and her escorts, and the other five were scuttled by their own crews when they ran out of fuel and ammunition. First to go was Erich Koellner which was trying to ambush the Allied forces, but was spotted by Warspite's Swordfish and subsequently torpedoed and shelled by the destroyers and battleship. Then Wolfgang Zenker, Bernd von Arnim, Hans Ludemann and Hermann Künne engaged the British forces, but only managed to lightly damage HMS Bedouin. British aircraft from Furious tried to engage the German destroyers but were unsuccessful; two were lost. Wolfgang Zenker unsuccessfully attempted to torpedo Warspite. Finally, when the German destroyers were low on ammunition, they retreated, except for Hermann Künne, which had not received the order. Hermann Künne was torpedoed and sunk by HMS Eskimo. Eskimo was in turn ambushed by Georg Thiele and Hans Ludemann, losing her bow but surviving. Diether von Roeder and Erich Giese, both suffering engine problems, fired upon the British forces while still docked, damaging Punjabi and Cossack, but they were both sunk before they could cause further damage. That was the last German counter-attack and the remaining German destroyers were scuttled soon after. The only German ship which survived within the port area was the submarine U-51. Shore batteries and installations were also very badly damaged by Warspite's guns. On the Allied side, the damage to HMS Eskimo kept her in Norway until 31 May 1940. German submarines again suffered torpedo failures, when U-46 and U-48 fired at the departing Warspite on 14 April. One thing that stands out with the use of Warspite was that the British evidently had no fear of that ship being lost or disabled due to German torpedoes - which could have happened if at least the German torpedoes had functioned properly. Yes the Warspite had a massive destroyer screen and the German destroyers were outnumbered, but the Germans would never have tried anything in reverse because they would never expose their big ships to the minutest risk of being torpedoed. Despite the naval victory it was still a strategic defeat because Dietl's ground troops were not dealt with, instead the redundent Kriegsmarine sailors provided the reinforcements he needed. In doing that Dietl showed the initiative lacking in many Kriegsmarine commanders. Germany's torpedo crisis worked a lot there. As Günther Prien in Scapa Flow many U-Boats had severe problems with their torpedos. Several were destroyed by the british after they attacked with not working torpedos. 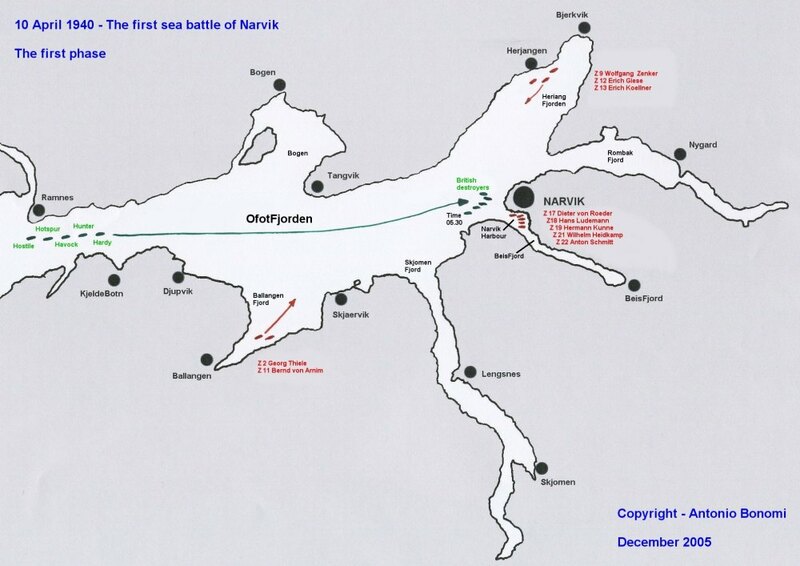 During Narvik several u-boats were stationed in the Fjord and the made no torpedo hit at all. Additionally fuel by german tankers came very late. german commander-in-chief admiral Rolf Carls calculated that the Germans will lose the half of the units in action. The main reason for the hectical invasion was the Altmark-case. Warspite was considered to be the most expendable of the British heavy units present and so she got the job of going in. If an R class had been there, it would have been designated instead. I agree, too, that British tactic, to send warspite was fine. British wanted to engage the enemy as usual, this is always not a wrong deceison, the main story Nelson proclaimed. But the german tactic was not so bad at all, too, but senseless, when torpedos have a general malefunction. because they would never expose their big ships to the minutest risk of being torpedoed. is generally correct and the german bigship tactic totally wrong. 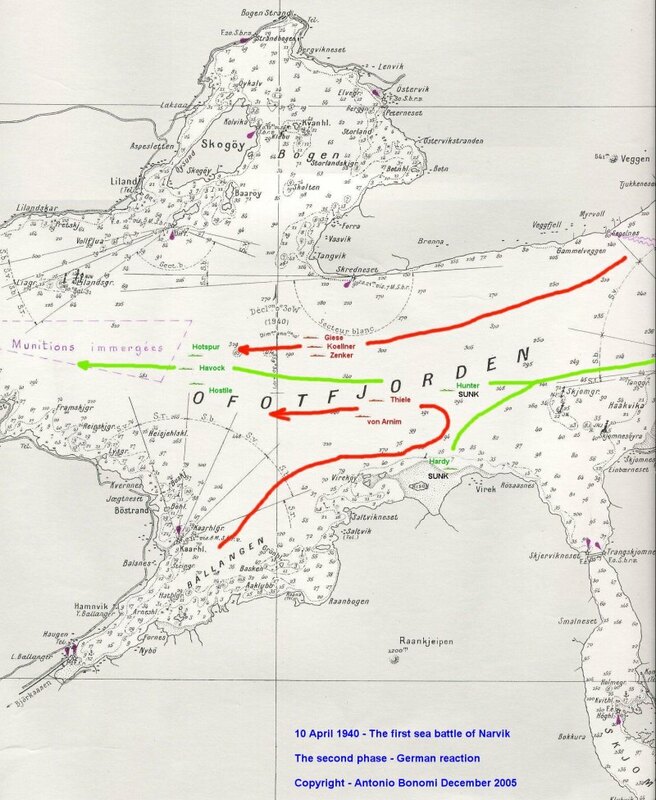 In this time the plan missed support of Luftwaffe to recognize the british big ships. Tiornu would perhaps have mentioned that heavy cruisers would have been more effective than warspite in close waters, but the british commander used the possebilities he has had. The quuestion is, RF, what you would have done as the german commander? what you would have done as the german commander? Looked up to the sky and yelled "Put the kettle on please, St Peter"
Warspite: an incredible ship with an incredible history! She was underestimated even by her owners only to come back with a new victory. And it was a lovely ship also, very beautiful. My father Cyril Cope was a 22 year old torpedoman on HMS Hardy in the first Battle of Narvik. He was one of the fortunate ones to survive. Subsequently he started the Narvik 2nd Destroyer Association in 1970's. This led to ship company members from other ships in the flottila / sailors from 2nd Battle /other armed forces members/ German armed forces members. I followed my father by joining the Royal Navy in 1964. Retiring in 1986. I accompanied my father to Narvik in 1990 for the 50th Anniversary taking many relevant pictures. My father passed away in 2003 but left me a number of audio transcripts which he wanted me to publish. However, it was not until this year, now I have retired from my second career, the task is almost completed. It was his torpedo crew which sent the first torpedo in that epic battle and that sank the 'Wilhelm Heidkamp'. Cyril Cope was in the unique position on the upperdeck throughout the first battle to witness the distruction caused and shortly after the attempts by Hardy's crew to 'abandon ship'. His account goes onto how they managed to survive and escape from the German alpine troops. Subsquently, the survivors being repatriated onboard HMS Ivanhoe, travelling from Scapa Flow to London on train being cheered at every station. Finally being received by Churchill on Horse Guards parade. Back to Hardy''s home port of Devonport before going back to his home city Manchester (Salford) on 'survivors' leave. I hope to write a book about the events including the immediate impact on families at home and since then. I have managed to make contact with some of the families but need more. I have also remarkably found 'Harry Rogers' aged 92 living in North East of England so far the only survivor I have contact with. He was meant to live to a ripe old age. As it was eighteen months later that he was a member of the ships company on HMS Prince Of Wales when sunk by the Japanese off the then Malaya coast. Very interesting account Ron. Thanks for the post. And of course a very warm welcome to this forum!!! When that manuscript is completed, you must post information about it on this board. That would be a fantastic read. Good Evening....and thanks to all those whom have since made posts to my initial contribution to the epic Battles of Narvik on 10th and 13th April 1940. This being the 70th Anniversary and my quest to eventually write a book I have been very busy making further contacts with either survivor or families of survivors and those unfortunates not to return home. Hence the delays in making another post but felt you may be interested in ongoing developments. I have had considerable assistance from Peter Mitchell whom is joint owner of a diving company based in Plymouth UK. His website is 'submerged.co.uk'. On there you will find sections under 'Narvik' dedicated to a few of the sailors of the five destroyers describing their own experiences. It includes my dad Cyril Cope's account. A story he never forgot both because of his apparent 'photographic memory'... albeit the events were forever imprinted in his mind. .in search... put cyril cope..second to forth installments on their 'podcast' you will arrive at hearing parts of Cyril's own audio tape. To give you just a few glimpse of the interesting stories from those contacted.. Norma whose father Walter Mitchell was a survivor accomapanied Walter (she was then in her twenties and unattached) to a German Naval reunion in Bramnerhaven in the 1970's. Norma recalls being asked to have a dance with the 'guest of honour' for a dance. Later her father whispered in her ear..never ever forget that experience..but did not elaborate. It was not until she contacted me to say she remembered his name as that of Kapitan Raeder that I remembered my father telling me that he was the son of 'Grossadmiral Raeder' (we all know who he was ..though I believe not a convinced Nazi himself). In 1971 on my dad's first return to Narvik he was greeted and hosted by the Norwegian Veteraner's. From this he gathered a significant amount of previously untold information which included the story that shortly after the 'Battles' ..two Narvik men of the 'Medical Corps' on arriving at the beach where Hardy was grounded saw two bodies on the rocks below. However, on reaching them one was a young German sailor and the other a British sailor with a 'Hardy' cap ribbon. They took the bodies into Narvik for identification and burial. It was later confirmed that the sailor from 'Hardy' was that of Hugh Mantle from South Wales aged 18, and the youngest to be killed. However, the irony is of two young men from opposite sides in a naval battle probably not fully understanding what they were there for, were prepared to die for their country. Times do not change much but at least these two countries now live in harmony. In 2005, Lillian, the younger sister of Hugh went with members of her family to Narvik in search of her bother's grave. After going on local information eventually they were told he was the only sailor of 'Hardy' to be buried in the Narvik unlike the rest buried in either Ballangen or Harvik. To Lillian's surprise they found the grave and looking around realised after days searching it was in sight of her own hotel room. Smales 'Hardy' lives in Exeter - Ralph Brigginshaw 'Hardy' living in Crawley - Les Ward 'Hunter' resides in Indiana USA - Gordon Pennell 'Hardy immigrated to Canada - Bernard Hallas Royal Marine 'Warspite' lives in Derbyshire. I have two contacts in Australia. I am visiting Malta this year. Whilst I am there I want to try to contact the family of 'Guisippe' (as of yet ..not got his surname). He was Captain Warburton-Lee's cook. (they are now called 'chef's' but to their defence to qualify it is the most difficult branch course in the Royal Navy because so far nobody as been able to pass). The story goes that prior to going into battle on the 'middle watch' of 10th April the Captain requested a meal. Unfortunately because of the state of being in 'action stations' Guisippe did not realise the galley flue was blocked for damage control purposes. This naturally caused concerns to crew members in the vicinity, taking immediate action when smoke appeared around the galley area. Unfortunately the resultant extinguishing of the fire led to the 'skipper' going into battle on an empty stomach. As is now known in naval history - approximately four hours later Captain Warburton-Lee was mortally wounded and subsequently awarded the first Victoria Cross of the Second World War. His last words were "I will never forget No 4 Gun Crew'. This was in recognition that irrespective of being given the order to 'abandon ship' they continued to fire the gun which allowed shipmates to escape mostly from the depths of the ship. Although the next stage was nearly as perilous by the challenge of swimming ashore in the cold fjord waters.